Welcome to the second of my weekly series, Friday Finds. I know, it’s not the most imaginative name is it. But like Ronseal, it does what it says on the tin. A chance to look back through some pictures taken over the last few years and show you some which I think are interesting – they might tell us a bit about the way my documentary wedding photography works, they may show you how I took a creative bridal portrait or they may just be a photo that I love for some personal reason and want to show off to you all. This week I’ve chosen a simple guest portrait from a Chinese wedding that I photographed in Cardiff. Jess and Ray got married at Cardiff Town Hall and chose me to do their wedding photography. This was my first Chinese wedding, and I’ll talk a little more in future weeks about some of the traditions at a Chinese wedding, but one of the main ones is the ‘tea ceremony’. These can happen all through the day and are a chance for the couple to meet, thank and receive presents from friends and family. I have picked this image for the very simple reason that I just love this gentleman’s expression. 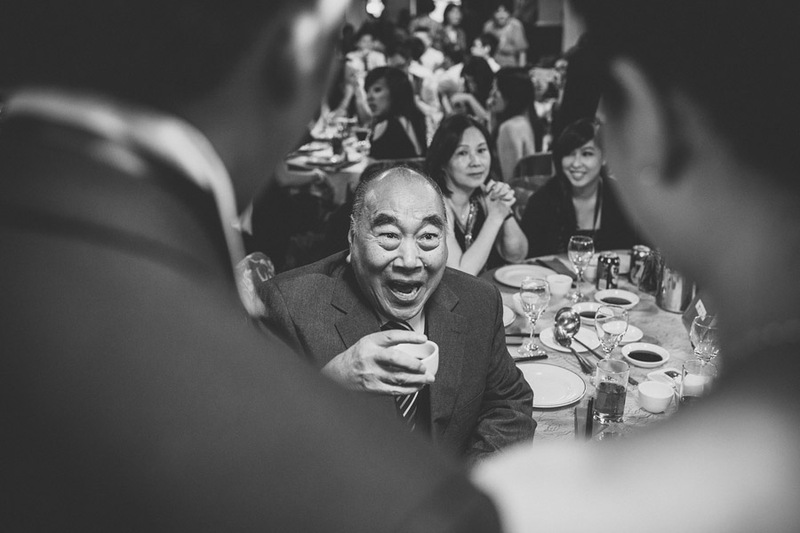 He was so delighted that that couple had come over to see him amongst all the guests, and I love how this shines through on his face, whilst framed by the couple themselves. Too cool. It is wonderful to see older people with such expressive happiness.